Every holiday season, we hope to see the magic of christmas to operate. And this Christmas, Le Printemps in Paris will reveal its amazing animated windows in presence with Gwyneth Paltrow in person. 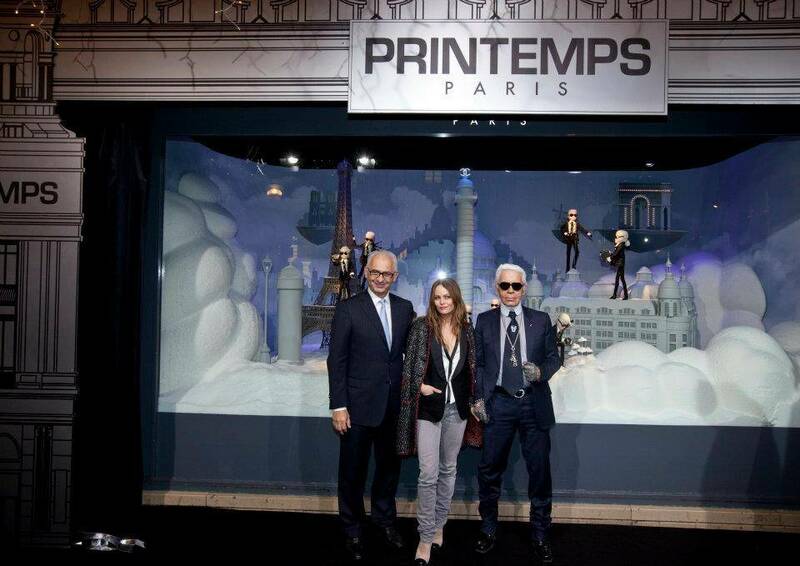 For the past years Le Printemps started a luxury strategy that is far beyond what other competitors are trying to do. In Paris you have Le Printemps and then there are others. In the world, Department stores became the key master pieces for all distribution strategies. Not only for Brands but for luxury clients. Sak’s 5th avenue in New York, Harrod’s in London or Takashimaya in Tokyo are priority destinations to all luxury shoppers. And for many years Paris was, lets put it this way, left behind. Galeries Lafayette was getting old, Le Printemps looking for a new positioning and Le Bon Marché… well on the other side of the river. But from 2006, Le Printemps reviewed its positioning, identity and marketing strategy. After millions of euros of investments, they moved towards a center of excellence, competing today with all big names in the world. To accomplish this level of excellence, they are working with the best creative people around the world, the best photographers and the top luxury brands. Every detail counts and every detail is taken care. This is placing Le Printemps as a leading name in the worldwide luxury industry. Every year Le Printemps celebrates Christmas as no one. They create exclusive and unique partnerships with the best luxury brands in order to transform christmas into a luxury party. We all remember when they got a partnership with Chanel and that Karl Lagerfeld in person with Vanessa Paradis were present for the opening evening. Again, there was the year when they celebrated christmas with Dior and even national TV came to admire a magnificent Marion Cotillard shinning during the famous windows reveal. This year, Le Printemps will reveal a great christmas partnership with Prada. Again, they work with the IT brand of the year, so nothing is let for chance. And guess who will participate to the evening reveal? Gwyneth Paltrow in person. Le Printemps shines and Galeries Lafayette sinks. While Le Printemps was announcing the appearance of Gwyneth Paltrow for the window revelation evening, Les Galeries Lafayette announced they would invite Léa Seydoux and André Dussollier. Well, definitely one Department store plays first league and the other…. not. We are quite far from the good old times when Galeries Lafayette used to work with the best, that Laetita Casta had became a icon for the Department store. Now, it is an old regional clientele who comes every year to the department store that would require a little deep renewal too. Luxury customers are used to such a high level of luxury in stores abroad that they will basically move on to Le Printemps. So this wednesday at 18:30 you can attend to the Galeries Lafayette windows reveal and the day after, you have the big event at Le Printemps. If you are a journalist or a blogger traveling for the event, you will definitely choose your date. More to come at the reveal this week. Info sourced at Gala website, media2.onsugar.com, Le Printemps official communication release, Galeries Lafayette communication. All content is copyrighted with no reproduction rights available.